Eastman Business Park is on the map, officially. Bolstered by strong support from area politicians, U.S. Commerce Secretary Penny Pritzker today placed on pin on a map of the nine county Finger Lakes Region, officially designating the area as a “manufacturing community." The designation opens the door for a share of $1.3 billion in federal economic development funds as part of a Washington, D.C. initiative to revitalize manufacturing in the area, and especially at Eastman Business Park – the top priority of the Finger Lakes Economic Development commission. 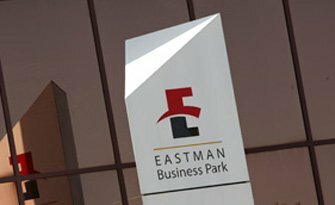 "The private-public partnerships that helped achieve this coveted federal designation of Rochester as a “manufacturing community" are the same ones driving the successful redevelopment of Eastman Business Park," said Brad Kruchten, President of Graphics, Entertainment & Commercial Films and Senior Vice President, Eastman Kodak Company. "We're excited by the potential to accelerate the substantial momentum in making the EBP an engine for regional economic development, and look forward to working with our partners in this effort." “It is with great excitement that the Rochester Region is one of only 12 communities nationwide to receive this special designation as a Manufacturing Community, giving the region preferential status when competing for economic development funds," said Mike Alt, director of Eastman Business Park. “Of course EBP is a very important element of this program, and will provide a huge boost to advancing the local economy." “This designation is an absolute game changer that will boost Rochester's advanced manufacturers to new heights by giving local businesses a leg up in competing for up to $1.3 billion in new resources," Senator Charles Schumer said.